It was a dry day with some grey clouds in the sky. 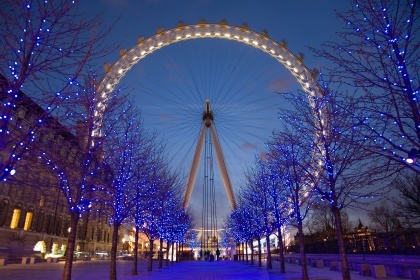 Many tourists are cued up eagerly to get the chance to ride up high on the ever popular tourist attraction The London Eye. Families waiting in turn to step onto that magical little eye shaped sky lift which resembles a fairground Ferris wheel. Further along in the cue you may see a couple of Japanese tourists wearing their “I Love London" Caps and tee shirts, and a huge camera dandling round their neck. All kinds of people use this popular attraction, nothing out of the ordinary. You can picture it now can’t you? A group of German tourists all look out across the view of London in awe of how stunning it is from that height. In the next carriage you have the Japanese tourists snapping away with their high tech phones, not really acknowledging the other sky lifts who are also taking selfies with the view of London behind them. On this particular day though, not just any normal day, no, this day was 420. 420? There are many, many people who still have no idea why this day is any different from all the others but then there are the worldwide 420 enthusiasts which have been waiting for this day all year since last April 20th, 2015. With loud music blasting from one of the other carriages, and a big group of people in there dancing around happily, this group of people were infact a bunch of web pranksters. They were also accompanied by rapper Black the Ripper and were creating a music video there in that cart while lighting up and smoking their suspicious looking cannabis roll-ups while all the tourists watch them in surprise. These hilarious jokesters clambered onto the eye at exactly 4:20pm , sparked up and had a merry old time in their rented out capsule while they gracefully took in the sights of London and while the other tourists in the capsules are laughing and pointing at them. The video was posted by Trollstation, a YouTube account which has more than 700,000 subscribers so that they could celebrate the Worldwide 420 cannabis event. Also taking place in London’s Hyde park was a massive gathering of thousands of people who were protesting for cannabis to be legalised and which some of those protesters were arrested or cautioned for cannabis related crimes. Trollstation then posted the video which had already been viewed by tens of thousands of times and released this statement along with it: As its 4/20 its only right we hotbox the London Eye alongside Dank Of England. 'LegaliseTheHerb’"
Smoking weed in an enclosed space in order to maximize the effects is called "Hotboxing"
The footage which was taken on the London Eye also features in their new song released by the rapper called "Light Up Everywhere"
"At approximately 6.50pm on Monday 18th April a smoke alarm was triggered in one of the London Eye capsules that had been privately hired by a group of guests." ‘As per normal procedure, the operations and technical teams immediately investigated and suspended the boarding process. " ‘It was quickly determined that some of the guests in the private capsule were smoking, instantly triggering the alarm and posing no risk to any other guests on the wheel at the time. ‘The Metropolitan Police were called and the London Eye Security Team met the group on the exit platform before escorting them from the site. We are working in close cooperation with the Metropolitan Police Service and will continue to do so on this matter.